We have to talk about Lee Hazlewood. 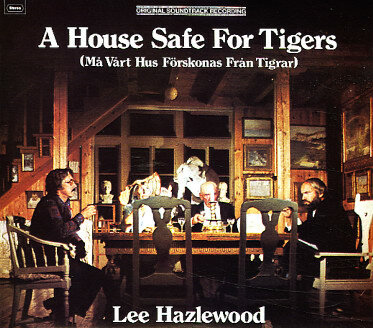 Let's start with A House Safe for Tigers, our 417th Soundtrack of the Week. The first song, "Souls Island", presented with Hazlewood's easily identifiable vocal style, is simple but melodically inviting. Part of its central motif is similar to a piece of the Gilligan's Island theme, which could be coincidence, homage or joke. It's reprised later on. "Our Little Boy Blue" is a tribute to a child's toys and how such things are outgrown. Then there's a version of the title theme for strings. The album concludes with a vocal take on it performed by a choir. Sunshiny country rock is a fair description of "Sand Hill Annie and the Russian Mouse", a laidback number more spoken than sung by Hazlewood. A similar vibe prevails in the next track, the slightly more urgent "Lars Gunnar and Me". "Las Vegas" is kind of an uptempo acid rock Latin jazz disco freak out and "The Nights" is a moody, shadowy number, again more spoken than sung by Hazlewood, apparently about the hardships of life in a Native American tribes, reminiscent in its fatalistic narration of Porter Waggoner.